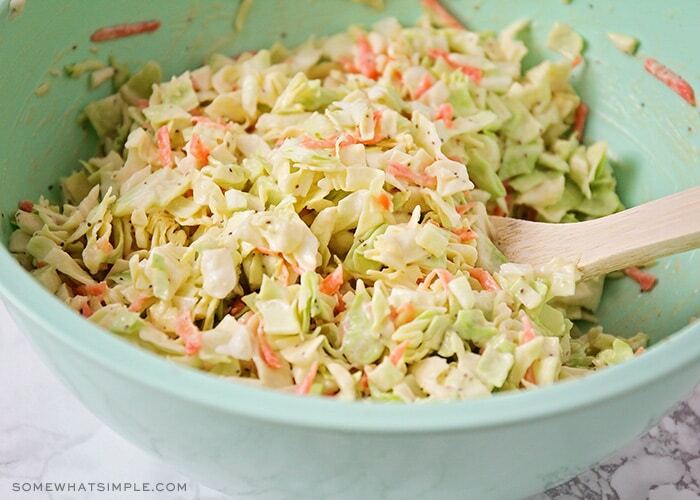 This flavorful homemade coleslaw is a delicious side dish or condiment! Made with cabbage, carrots and a homemade dressing, it’s a perfect side dish for barbecues and potlucks, or enjoy it as an afternoon snack! Ready in just 5 minutes, this is the easiest coleslaw recipe you’ll find. Who else loves homemade coleslaw? I didn’t grow up eating cabbage very often as a child, so I was a little skeptical about anything cabbage-related as an adult. My husband is a total coleslaw addict, and after a few years together, he finally won me over. It is now one of my favorite salads to make, because it’s so easy, and it goes well with so many things! We love it on top of barbecue sandwiches, as a side dish for grilled chicken, or as a delicious accompaniment to fried chicken. Making your own coleslaw at home is both easy and delicious! 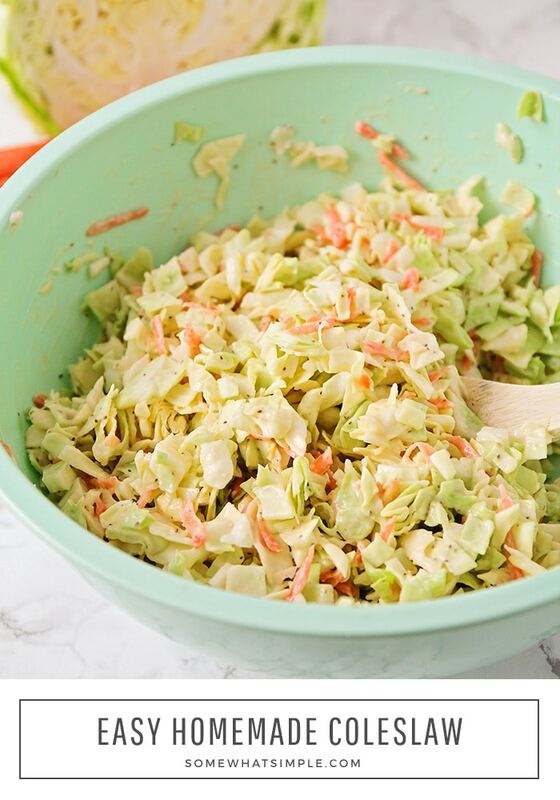 Making this classic homemade coleslaw recipe is as easy as it gets! It’s literally as easy as 1-2-3. Simply chop some cabbage and grate some carrots, then mix them together in a bowl until they are well blended. I chopped up my cabbage with a knife, but you can use a food processor to make the process quicker and easier. You can buy coleslaw dressing, or step up your coleslaw game and make your own! 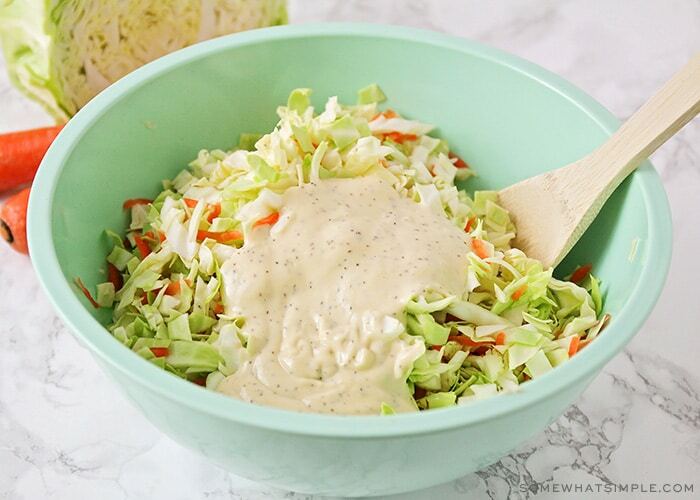 This is our favorite Homemade Coleslaw Dressing. Add your dressing to the cabbage mixture and coat it well. This literally takes 5 minutes to make!!! Refrigerate the coleslaw for at least two hours before serving. This is an important step because it will allow the dressing to soak into the cabbage for the perfect texture. Since this recipe is so easy to make, you can quickly put it together the night before and leave it in the refrigerator over night. Coleslaw will keep in the fridge for about three or four days before you’ll want to toss it. I actually think it tastes better the day after I make it! My family loves coleslaw so I’ll usually store the leftovers in these small deli containers so they can take some to school or work the next day. Coleslaw is a classic summer BBQ side dish and is perfect for some of our favorite recipes. Try serving it with one of these easy meals. 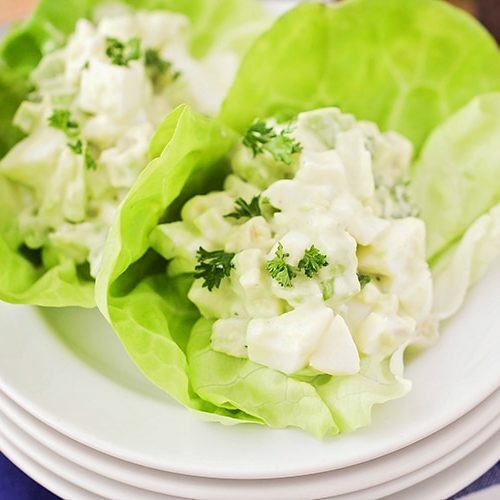 Homemade coleslaw can also be a used as a delicious topping on some sandwiches and tacos. Try adding it on top of one of this simple recipes. This homemade coleslaw is definitely one of my favorite side dishes! Give is a try today and let us know in the comments below how you liked it. Is there anything else you love to add when you make coleslaw? 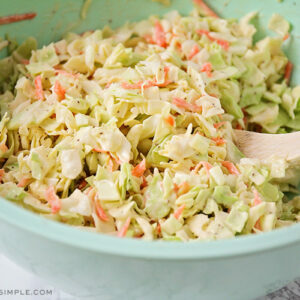 This flavorful homemade coleslaw is a delicious side dish or condiment! It's perfect for barbecues and potlucks, and adds great flavor! Add the cabbage and carrot to a large bowl and toss to combine. Pour the dressing dressing over the cabbage and toss until fully coated. Will keep for up to 2 days in the refrigerator. 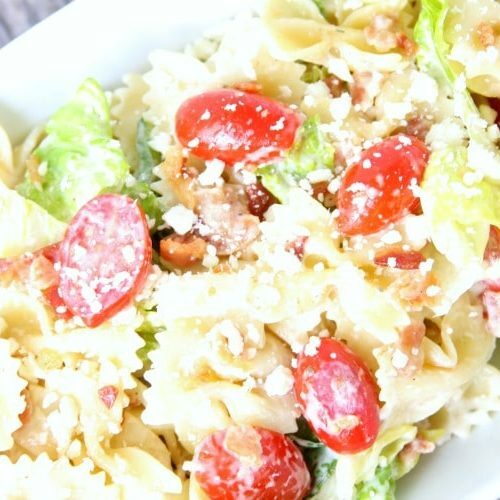 BLT Pasta Salad Recipe – Simple and Delicious! 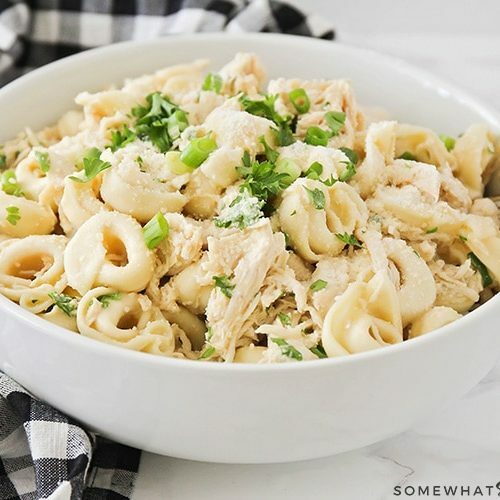 Chicken Tortellini Salad – Simple, Fresh and Filling! This has me wishing it was time for BBQ’s & warmer weather! Love coleslaw! 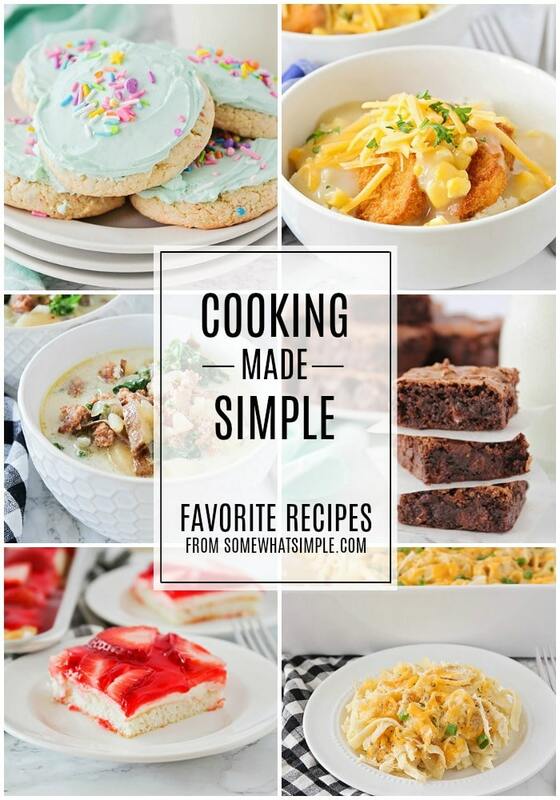 It is the perfect side to so many dishes, so easy to make, & delicious! This recipe is SO much better than what you get in the deli at the grocery store!! Thanks Cheryl, so glad to hear you loved it! This is such a summertime classic! We love having it with pulled pork when friends come over. Everyone always raves about it. Thanks Sabrina! I love it with pulled pork too!! Homemade slaw is the best! We love this in the summer or with pulled pork from the crock pot in the winter. This looks great! Perfect side dish.